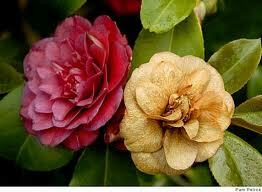 In general camellias are healthy plants with few problems compared to others. Camellias have a few weak spots, however. Root rot and dieback are two diseases that can result in death to the plants. Flower blight poses a serious problem as it disfigures blooms, but it does not cause death or decline of the plant. Once your camellia has been planted in an area that has enough sun to keep its leaves green and enough shade to shield it from too much sun, it will sustain itself primarily through its roots. Camellia roots need three basic things to keep them happy: nutrients, water, and oxygen. Some nutrients are naturally present in untreated soil, and some established camellias can survive for years with no attention at all. Most camellias will benefit from additional food that their human caretakers provide, however. Ready-to-use commercial mixes are available, or you can create a special potion to fit your particular soil. Water dissolves the added nutrients and enables the roots to absorb them. Roots also need a certain amount of oxygen to help in the "digestion" process. If the soil is not properly aerated, and enough drainage is not provided, the roots become waterlogged and can't function as they should. This can lead to a condition known as root rot. 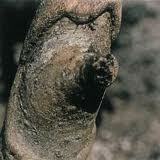 Camellia root rot is caused by a fungus ( Phytophthora cinnamomi ) which occurs in the soil. 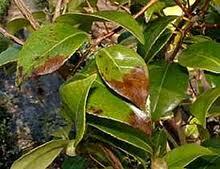 This pathogen may be found occurring naturally in the soil or it may be brought in on the roots of camellias, rhododendrons, and other woody ornamentals. Most Camellia japonica varieties are susceptible to root rot, while Camellia sasanqua and Camellia oleifera are not as vulnerable. Root rot is usually associated with poorly aerated or poorly drained soils. Symptoms may appear at any time, but they often show up during periods of hot, dry weather. 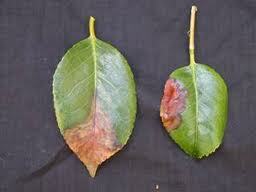 The first sign of this disease is the stopping of growth either with or without yellowing leaves. In more advanced stages the leaves on one or more branches become gray-green, wilt, and finally die. 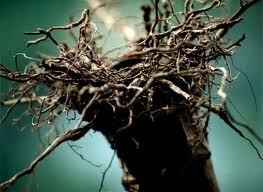 If the roots are examined they are brown with rot. Using fungicide as a soil treatment may help. 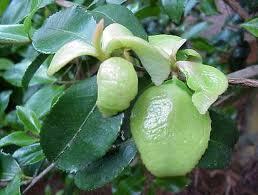 When grafting, use C. sasanqua and C.oleifera as understock. Choose vigorous, fast-growing varieties of camellia plants. Most important, improve the drainage of the soil. Dieback is a serious disease of both C. japonica and C. sasanqua. It is caused by the fungus Glorerella cingulata . This fungus enters plants through wounds resulting from leaf scars, hail injury, pruning cuts, falling branches, insect damage, and lawn mower or string trimmer cuts. Insects that walk across wounds can spread the fungus. 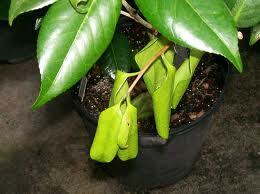 It can also be disseminated through moisture splashed on the wounds from rain or regular watering. The disease usually appears during the spring and early summer months. Dieback is characterized by a sudden wilting of new growth, particularly in early summer. The leaves cling to the branches for a long time after they die. Cankers sometimes appear at the infection point, and may ooze pink masses of fungal spores during extended periods of wet weather. The best control of dieback is sanitation. 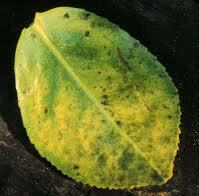 The fungus lives inside the plant and spray cannot completely control it. Remove the affected branch about six inches below the lowest visible symptom of disease. After each cut dip pruning tools in a commercial fungicide or a solution of one part chlorine bleach to 10 parts water. Spray resulting wounds with the disinfecting solution. Diseased twigs should be physically removed from the area of the plant, and either burned or discarded in garbage. Spraying plants with a fungicidal solution in the spring during the normal leaf-fall period will help to prevent spread of the fungus. 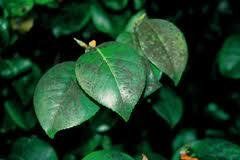 This camellia disease is caused by the fungus Ciborinia camelliae. It occurs only on the flower and does not affect the rest of the plant in any way. 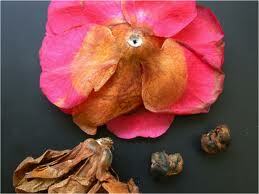 Since camellias are enjoyed mainly for their blooms, this disease can be really disheartening. Flower blight is not usually a problem early in the season. It generally appears in late winter to early spring when temperatures are on the rise. It may be seen earlier if conditions are proper for the fungus. Warm, humid weather following a cold spell will cause sporulation of the fungus and subsequent infection. 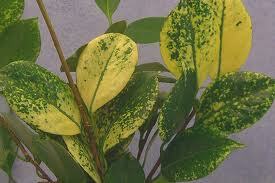 This disease is characterized by brown spots on the petals. These usually enlarge until the entire blossom is blighted. Infected flower tissue feels "slimy" to the touch. Infected flowers fall to the ground and the fungus produces hard, resting bodies called sclerotia. These sclerotia may remain under the bush or in the soil or debris for several years. Under proper weather conditions (temperatures from 45 - 70° F and wet) these sclerotia germinate and develop saucer-shaped mushrooms (apothecia) about one-half inch in diameter that release spores. These spores are carried by the wind and cause infection when they land on a flower. Remove and destroy all fallen blooms. Picking up all fallen blossoms every year would disrupt the life cycle of the fungus. This would only be effective, however, if all other camellia growers in the area did the same, as fungal spores can easily blow to another plant. If flower blight has not been found in an area, it is important not to bring flowers or infected soil on plants into this area. Protective fungicidal sprays provide only limited protection. No proven eradication method has been found, although testing continues. Some fungicidal sprays, such as Bayleton, applied weekly will reduce disease incidence but not eliminate it. 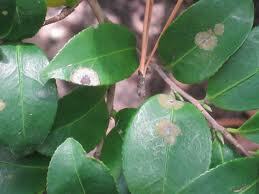 Other diseases : Other camellia diseases include leaf gall, sooty mold, lichens, nematodes, and virus variegation. None of these is usually life threatening. For more information on diseases, visit the American Camellia Society website.